Approximately an hours drive east of Nashville, Interstate 40 crosses the Caney Fork River 5 times. 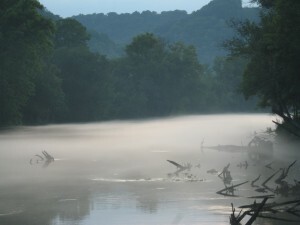 Little do many transients know, the seemingly slow, meandering river is one of Tennessee’s best trout tailwaters. The Caney Fork River below Center Hill Dam is our primary stomping grounds. Since the new slot restrictions passed, it will continue to improve and keep rising as one of the southeast’s premier trout fisheries. We are very fortunate to have this river close by. The Caney Fork stretches for about 27 miles below the dam before its confluence with the Cumberland River. Trout can be found in its entire length, but most anglers focus on its upper half where colder temperatures remain steady. The Caney is a quality year-round fishery, and has good wadeable waters at its access points when the water is down. The majority of the land along the river is privately owned, so the public access points such as Center Hill Dam, Happy Hollow, and Bettys Island get pretty crowded, especially on weekends. There is a good amount of shallow flats and runs, along with plenty of deep water and cover for the brown, rainbow, and brook trout that call the Caney Fork Home. The Caney and its generation schedule is Just like most other tailwaters, where high water can be both frustrating and productive. This river is one of Middle Tennessee’s only options for breaking out the 8 wt rods and big, nasty streamers for heavy trout. When the water is up on the Caney, dont be surprised to see those streamer junkies come out with their heavy rods and that crazy look in their eye. This is the type of fishing that you can spend all day working on the boat to strike out, or hook into the fish that makes your day and/or haunts your dreams. 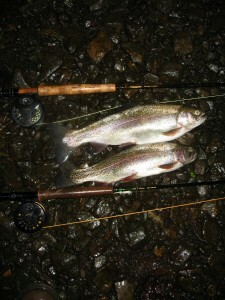 When the water is down, the fishing can be fantastic for wading anglers. The fish are not particularly leader shy, but sometimes they are very picky as to your presentation. The situational fishing on the Caney in different parts of the river can keep you busy all day and at times keep you guessing all day as well. Crowds on the Caney Fork have definitely grown with the river’s popularity, but the fishing remains to be good. Everyone I have talked to about the slot limits and brown trout regulations is thrilled. With any luck, the new regs and their enforcement will lead to an improvement on an already very solid fishery. The successful introduction of the scrappy brook trout into the Caney Fork has given anglers the opportunity to get the Caney slam, and yet another reason to fish this great river. Center Hill Dam is located in Lancaster, just about an hour from downtown Nashville. Most people use exit 268 which is Buffalo Valley Rd. and follow the signs to the dam. There is plenty of parking at the dam, and room to launch a boat as well. the Nature trail follows the river downstream to the steps and provides more access by foot during periods of low water. Crossing over the dam from the Resource managers office, take the first right and you will find Long Branch Recreation area, open April thru October, with tent/RV campsites, showers, and a boat ramp. Reservations are required to camp here so be sure and call a few days in advance. Continuing past the campground, the road follows the river, and you will find some pull offs to park and walk down to some good wade fishing. Happy Hollow is another popular public access, and if you exit interstate 40 at Buffalo Valley Road, it will be the first thing you come to when heading toward the dam. Happy consists of a gravel parking lot and a boat ramp. just the necessities. turning left off of I-40 East and then left on St. Marys Chapel Road will take you to Bettys Island, another gravel parking lot and boat ramp. These three access points mark the most popular access points for the Caney Fork. The Caney Fork Makes for the perfect day trip from Nashville, but if you want to camp near the river, there are a couple of options: the aforementioned Long Branch Rec. area, and then Edgar Evins State Park, about 10 minutes from the dam. They have a self-registration campground that has power, trash cans, and showers. there are also some primitive campsites in the campground that are first come first serve. the fee is $20 per night. As always, check the generation schedule before you go! check it online before you leave, and call the lake information line before getting in the water at 1-423-751-2264. Press 4 for predicted units, then 37 for Center Hill Dam. Rod:a 4-6wt rod with a floating line will handle most situations on the Caney in low water situations. In high water though, 6-8wt rods are necessary with at least sink tips, but a sinking line would be better. Leader:as in most tailwaters, these fish arent leader shy, but presentation is the name of the game. Base your leader strength off of the size of the outfit you are using. if you’re not throwing streamers, a 9 foot 5x leader will do, and then taper down from there. When you break the streamers out, bring some shorter, stronger leaders. Remember the potential for HEAVY fish is there, do you want them breaking off? Also be sure of your knots! Flies:Choose your poison, use a good prospecting fly for starters – dry/dropper combo or a good wooly bugger. The Caney allows you to branch out some from the other tailwaters, but don’t leave home without the basics: Midges, soft hackles, pheasant tails, copper johns, parachute adams, and your favorite streamer patterns. When the water is up, bring those big scary flies that you think will never see the water! Wading/floating:The Caney Fork can be waded at the public access points during low water periods. Always check the schedule before you go, and keep an eye on the waterline. If youre floating in low water, anything with a shallow draft will do. In higher water, wear a life jacket, and float it in something stable. Many float it in jon boats and motor upstream, and we have even seen some high dollar bass boats on the high water as well, not sure how clever that is, but regardless, just be safe. Remember to check the TVA website and save the number in your phone to check the release schedule frequently. Good luck, and always leave the river cleaner than you found it. Lets help this river keep improving on its already awesome potential.